She’s heard the stories–wild things live in the woods beyond the walls of Optica, creatures that skin people alive or drive them insane. But a new threat has arisen within the city and those she loves are in danger. If she can slip past the city’s eyes, beyond the walls and into the wild, will she find help or merely join the list of those the wilderness has destroyed? Red is about to find out. 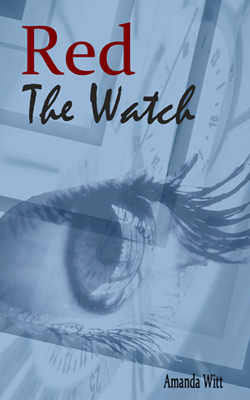 The Watch is the first of four books in The Red Series. One day my teenagers and their friends cornered me in the kitchen and said, “You’re always writing. Why don’t you write something for us?” They were all voracious readers, and didn’t like what they were finding on the library shelves. So they wanted me to write a series of books, and they had definite criteria. We had to do a little negotiating–five of the six were boys, and I wasn’t sure I could write believably as a teenage boy. They agreed to let me make a girl be the main character, but in return I had to promise that there would be strong male characters, and that those characters wouldn’t be constantly getting rescued by girls (an occasional rescue was okay). For a couple of weeks I brainstormed in a broad, general sort of way, thinking about the setting and the conflict. Then a visual image sort of came to me–I think maybe it was actually a dream–of a young man running down a dark street, with electric blue lights reflecting off the wet pavement, while behind him a young woman slowed down to catch her breath and had, in that moment, a terrible sense of foreboding. The characters in that image–Red and Meritt–became the central characters of the novel, based entirely on the emotions I had felt while envisioning that scene. The other characters simply walked in on cue. When the rain stopped we left the doorway and began to run. It was dark, but the streetlights cast an electric blue glow, flickering beautiful and eerie against the wet pavement, casting patterns on the drifting mist. I wished we could run in the light. Instead we ran in the shadow of the rough cinderblock wall that divided the street from the houses. The wall had cameras on both sides, but Meritt knew which eyes were blind. He led me back and forth from the street side to the house side, through the intermittent gaps in the wall, weaving us through the web of invisible threads so that none of them ever touched us. We ran a long way, through air that was crisp and damp and smelled like autumn leaves, and it felt good to run, to pour the tension of the past week into sweat and breath and motion. Tomorrow the tight fist of anxiety in my chest would be back, but tonight, running hard through the wet forbidden streets, I could breathe. When the white spotlight from the watchtower swept toward us we paused, pressing against the rough wall; when it passed, we eased out and ran again. Meritt kept pace with me until the houses ended, until the street and wall ran past nothing but orchards and empty stubbled ground. Then he let loose and raced ahead, hurtling through black shadows and pockets of blue light. I couldn’t keep up with him; I didn’t even try. Instead I slowed to push a stray lock of hair back under my black cap as few belated raindrops pattered down, cold against my hot skin, and the rising breeze sent the sharp tang of fermenting windfall apples wafting past. Breathing deep, I tasted the damp night air, felt the last knots of tension relax in my shoulders, my neck. This was good. This was the happiest I ever was, out running with Meritt in the dark. Ahead of me Meritt turned and raised a hand, trying to get me to hurry. He didn’t call to me because we weren’t supposed to be out this late, we weren’t supposed to be here, we weren’t supposed to be together, and we certainly weren’t supposed to be meeting Rafe. But I didn’t want to hurry. I was tired, and he knew he was faster. It wouldn’t hurt him to slow down and wait for me. So I waved back, cheerily, as if he were just waving to be friendly. He shook his head at me, reproving. He was still moving, jogging backwards, and as we pantomimed our little argument he veered a bit, away from the wall, into the glow of the electric blue lights. They caught at the sharp planes of his face, danced in his unruly black hair, and a cold fist formed in my stomach and I stopped moving altogether. He didn’t look like himself. He didn’t look like the Meritt I’d known all my life. The street was dark and empty and we were all alone, and he had turned to light and shadow, wrong-colored, frightening and strangely beautiful. He looked like the things in the woods. Now he was truly exasperated, spreading his arms wide—what are you doing?—but I couldn’t move. I put one hand against the wall beside me, feeling its rough surface, the cold damp scratchiness of it, and it was hard and real and kept me upright while my vision darkened and then cleared, lightheadedness passing when I remembered that breathing was a good thing, remembered, too, that there weren’t really things in the woods. Those were stories, nothing more. Bogeymen to keep people in line. The white spotlight swept toward us again and Meritt backed against the wall, but I was still paralyzed. The light flashed in my eyes, blinding me, and all I could do was stand frozen and try not to attract attention with any sudden movement. We mustn’t get caught. Bad things happened to people who got caught breaking the rules—prison time, cut rations, reassignment to the worst jobs. I didn’t know what exactly the wardens would do to me if they caught me out after curfew, and I didn’t want to find out. Then the spotlight moved on and my eyes adjusted to the dark and I saw Meritt up ahead, looking like himself again, grimacing wryly at me. With one last adamant sweep of his arm—come on—he spun and sprinted toward the end of the street, toward the opening in the other wall, the outer one that circled the entire city. After one last deep breath, feeling my head clear and my heart unclench, I started running too. We were meeting Rafe outside the outer wall, in the broad stretch of sand and scraggly grass that marked the boundary between the city and the woods. We called that strip of boundary the wasteland, but despite the ugly name we liked the place. It wasn’t the suffocating city, and it wasn’t the dangerous woods. We went there whenever we could, and this time Rafe would be there with us. He’d been one of our teachers back in school, my favorite because he was good at explaining things and, most of all, because he never treated me like an outcast or a freak. On bad days I pretended—secretly—that he was my father. If I loved anyone as much as Meritt, it was Rafe. Slowly, throbbing through my veins, joy began to return. Meritt and Rafe, both at the same time. I felt a smile start and I leaned into the wind, running hard, while ahead of me Meritt sprinted full-out down a thin channel of shadow, his bare feet flashing, the muscles in his back moving beneath the gray uniform shirt, all of him lit in fits and starts by the blue light shifting and shining along the periphery. That sight will always stay with me, that feeling. It was the last moment of before. I dream about it now, and I’ve dreamt it so often I can count Meritt’s steps, hear the soft whistle of the rising wind, feel the last breath I drew in—too harsh, too loud—when I saw what was going to happen and had to bite back a shout, had to stop again and let him go.